We’re delighted to have a guest post this week by crime novelist T.G. Campbell, author of the wonderful Bow Street Society mysteries. Admirers of the World’s Greatest Detective would agree there is only one Sherlock Holmes. Purveyors of the English Golden Age of Crime Fiction would admit there can be only one Belgian solving crime with his “little grey cells”. Skip over the pond to the mean streets of 1940s Los Angeles and the likelihood is you’ll think of Humphrey Bogart’s Phillip Marlowe. What do all these detectives have in common? They stand alone in their respective worlds as the pinnacle of deductive reasoning. They also have the tendency to keep their thoughts to themselves while the readers, like Doctor Watson and Captain Hastings, scramble to make any sense of things. Yes, we, as readers, are shown precisely what Holmes, Poirot, and Marlowe see & hear but we are often left awestruck by not only a mystery’s solution but also the ingenuity of the Detective’s deductive reasoning. Whenever we read a mystery featuring any of these Detectives we bring to it the subconscious expectation that it will be they who will lift the veil of confusion and resolve the conflict caused by the murder. They, and Detectives like them, may be assisted by others along the way but, generally, the sidekick doesn’t step in at the last moment to announce the correct identity of the murderer. This rule applies even in novels where the Detective openly airs his internal musings to a trusted colleague or friend. In short, these lone Detectives are put on a plinth as masters of their craft by us as readers – and there isn’t anything wrong with that. In fact, it is this consistent element within these stories which serves to reassure us that all will be well in the end. We have seen the Detective work his/her magic previously which makes us confident he/she will do so again. What if there was more than one Detective, though? Furthermore, what if there were several Detectives who stepped into a mystery series only when they were required? No longer would you have this omnipotent Detective who always kept his cards close to his chest. Instead you would have a collective whose very success relied on their relying upon one another’s abilities. The Detective’s plinth would be lowered and we, as readers, would feel equal to the Detectives we were reading about rather than to their bumbling sidekick. This is the idea I wanted to explore when I created the Bow Street Society. Every one of its members has been recruited, from the public, because they hold a great deal of knowledge in a particular field and/or are adept at a specific skill. For example, the first book, The Case of The Curious Client, features a Magician, Architect, and Veterinary Surgeon among the Detectives investigating the central mystery. They are not hard-boiled Private Detectives, retired police officers, or incredibly scientifically minded. They are, in short, average. Yet it is their averageness, and passion for their chosen occupation, which makes them perfect for solving crime. For example, an autopsy performed by the Veterinary Surgeon on a dead cat in The Case of The Curious Client helps the collective reach the final solution. I consciously made the decision that there wouldn’t be one, lone member of the Society who would deduce the solution. That is why, when it is given, they have all played a part in reaching the truth. 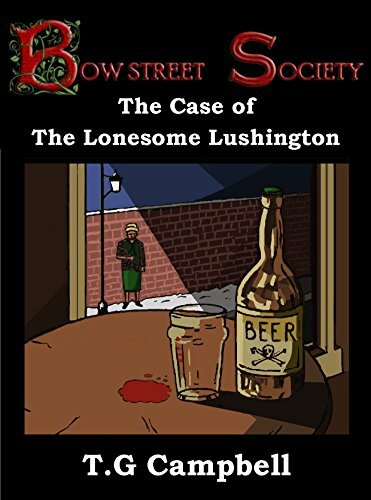 When it came to the Society’s next book, The Case of The Lonesome Lushington, I wanted to go one step further. The Architect, Lawyer, and Veterinary Surgeon who’d appeared in the first mystery were not included or even mentioned in the second. For the plain and simple reason their skills were not applicable to the case so they weren’t asked to investigate it. In the first book I’d stepped away from the idea of the lone, omnipotent Detective but in the second I’d stepped away from the idea of a static, rigid collective of Detectives, too. One could argue that connections with characters can’t be formed if they’re not included in every book. I would beg to differ. Who is assigned to a case is decided upon by the Society’s Clerk, Miss Rebecca Trent. The reader doesn’t know who she’ll choose until the case has been accepted. Therefore part of the intrigue is discovering if your favourite character will be selected or not – this time. I fully intend to have reappearances of the Lawyer, Architect, and Veterinary Surgeon in future Bow Street Society books. Any connection the reader makes with particular characters would therefore never be in vain. There are, within this fluid collective, core characters that’ll always be featured to safeguard the reassurance of order, however. Miss Trent is one (she being the only person who knows the name of every Society member) and Mr Samuel Snyder, the Society’s Driver, is another. It must be pointed out that, though Miss Trent is the Society’s Clerk, she isn’t a Detective. Instead she organises and disciplines the members whenever necessary but otherwise keeps to the side-lines. Mr Snyder, on the other hand, is a Detective who works with the other members in addition to driving them around. The Bow Street Society is designed as a reflection of us all. Within its universe the mundane becomes pivotal and we discover we all have the potential to solve the most baffling of crimes. The lone detective, or rather the idea of it, is murdered and we are all, quite simply, the ones whodunnit. Not because we despise the brilliance of Sherlock Holmes, Hercule Poirot, and Phillip Marlowe but because we all, deep down, want to be as brilliant as they are. In the 1896 London of the Bow Street Society, you now can be. The only question that remains therefore is this: what would be your field of expertise as a Bow Street Society member? T.G. Campbell (short for Tahnee Georgina) wrote her first crime fiction story at the age of sixteen as a gift for her best friend. 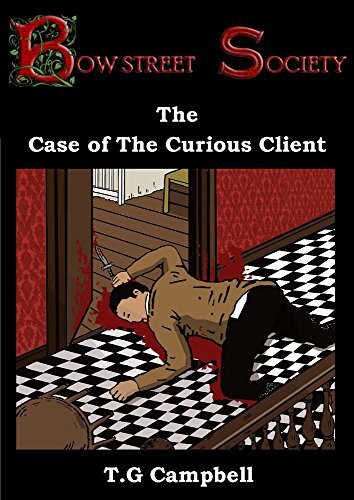 At only 40 pages long it fell considerably short of a “novel” but it marked the beginning of a creative journey that would eventually spawn the first of the Bow Street Society mystery novels; The Case of the Curious Client. In April 2017 The Case of The Curious Client won a Book Award with Fresh Lifestyle Magazine (http://www.freshlifestylemag.com/book-award-the-case-of-the-curious-client-a-bow-street-society-mystery.html ).